Marc Chapman has won his first World Crazy Golf Championships. The championships took place at Hastings Adventure Golf on June 9 and 10, with the largest number of competitors in the field since 2005. 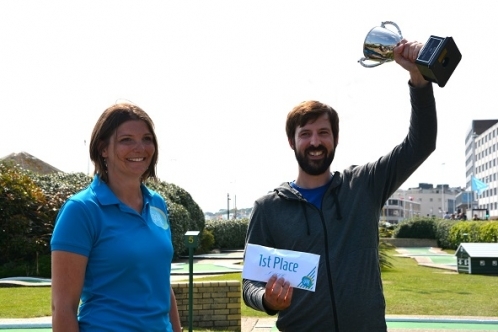 Marc took the world title and �1,000 prize money in the two-day mini golf marathon. His score was 226, 26 under par, beating last year�s top score by Czech Republic�s Olivia Prokopova who took the 2017 title with a score of 235, 17 under par. Adam Kelly took runner-up prize of �750 and Michael Smith, former World Champion, took home �500 for third place. Playing along side the seasoned crazy golf professionals was a separate novice category with a dedicated prize fund of �1,500. The novice title and �500 went to Russell Smith from Tunbridge Wells. The runner-up Chris Horn took home �300, while third place went to Italian Mark Berezicki who won �200.